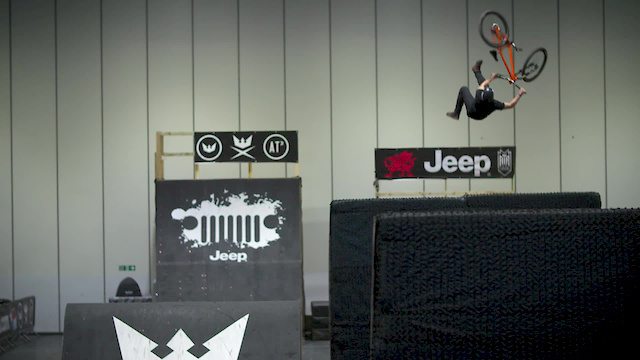 This year's London Bike Show played host to Air to the Throne, the biggest freestyle Mountain Bike contest ever held within the UK. The huge course and generous prize purse drew riders from across the globe to compete. Check out all the best action in this wicked edit. Filmed by Robin Kitchin, Andrew Lawrence and Tolli Myers. Edited by Robin Kitchin. Photo recap can be found here. Awesome! Rogatkin is an absolute animal! Rogatkin's run was awesome. And Matt Jones killed it too. Shame we didn't get to see Sam Pilgrim compete though. That Frontflip no hander was insane! how did he just got 5th place!!! A 1987 Mitsubishi lancer between the jumps would be a more suitable vehicle. Don't know anyone who rides well with a car worth more than their bike(s). I don't know ho he is or what it's called, but that move at 4:50 was legendary. It's a shame they didn't show the Sunday finals... Rogatkin's triple tailwhip and Adrian Tell's double backflip attempt were pretty wild. Parabéns Nuno Pintas. A D2J tem orgulho de te ver evoluir, mesmo sem os devidos apoios... contamos contigo nas provas regionais! Wee clip of Ben Savage at the end there. "The biggest freestyle Mountain Bike contest ever held within the UK" - What about the Nissan Qashqai challenge in London? For some reason I think I need a Jeep and a 4k 360' camera.